Deputy Paws and the Puppy Mill Cause is an animal story book for children written by Peggy Race and illustrated by Mike Motz. Deputy Paws lives with his loving human companion, and he has his own bed, toys and a grand backyard to run and play in -- but it wasn’t always like that for this adopted rescue dog. He was born in a puppy mill to a mom and dad who spent their lives living in a cage. Deputy Paws grew up with wire caging under his feet, and his health care and needs weren’t considered. The people who ran the puppy mill only cared about making a profit. Deputy Paws was lucky. National Mill Dog, a rescue organization, found him and took care of him at their shelter until he found his forever home and his human best friend. Deputy Paws is committed to sharing his story so people know to adopt their next dog or puppy, rather than buying them from a pet store or an online seller. He also shares some tips on how kids and parents can get involved in helping put an end to puppy mills. 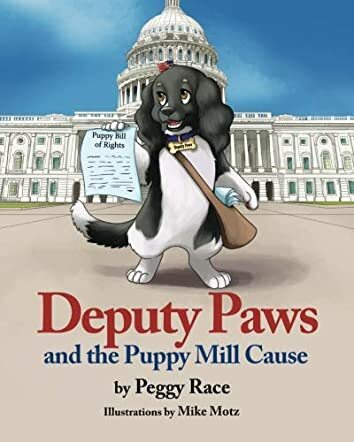 Peggy Race’s animal picture book for children, Deputy Paws and the Puppy Mill Cause, was inspired by one of her own rescue dogs, Deputy Paws, a cocker spaniel mix. Race’s story is upbeat and fun while teaching children and their parents about the plight of puppy mill dogs and encouraging them to adopt from their local shelters instead. Deputy Paws is a marvelous spokesperson, and Mike Motz’s bright and cheerful illustrations certainly do make him and the other dogs kids meet in this story come to life. I love the practical ideas Race provides that everyone can do to help tighten up the regulations on dog breeding and put animals first rather than profits. This book is a marvelous way to approach adopting a new family member with little ones who’ve not interacted with dogs before. Race shows Deputy Paws as a living being with feelings and needs, but also as a potential best friend. Deputy Paws and the Puppy Mill Cause is most highly recommended. Great book for kids of all ages! I love the rhyme scheme and the illustrations, but most of all, I love the message. It is presented in a practical and friendly way and should be spread easily through this great book!